There are many benefits to running a freelance blog alongside your freelance business, but what happens when you run out of article ideas? This guide will ensure you can always generate new, relevant blog post ideas to keep your blog up to date. Having your own freelance blog is a fantastic idea. Read our post on why every freelancer should have their own blog for more. Inevitably, you will reach a point where you are struggling to find new ideas for blog posts. So, what do you do? Well, you’re certainly not going to stop blogging! Below, we’ve listed our best tips to generate great blog topics that your readers will love - so start filling up your ideas list and always have content ready to publish! Here are some fantastic ways to find blog post ideas - in the next section, we’ll discuss how to find keywords relevant to those topics. BuzzSumo allows you to find the most popular and searched for content online. This is extremely useful, because you can search for your niche and find the most read and shared content online relating to that topic. It makes sense that if people are already reading about a certain topic a lot, a post of your own related to that topic is also going to be very popular. Immediately, we can see that the most popular post by far on this topic is productivity tips - although there are only 3 methods to boosting productivity listed. You could therefore write a bigger and better post on how to help freelance web designers boost their productivity and expect it to be popular with your audience. Facebook groups are a great way of networking with other bloggers and freelancers in your field. It’s also a great way of finding out what kinds of questions related to your field people are frequently asking. For example, do you see a lot of posts from people asking how to use a particular piece of software? How to find new work? Use the archives of your Facebook groups to find the most commonly asked questions and base your blog topic ideas off of those inquiries. Pinterest is essentially a visual search engine, and millions of people use it every day to find the answers to their questions. One of the best features of Pinterest is the ‘suggestion’ bar that runs along the top when you search for something. 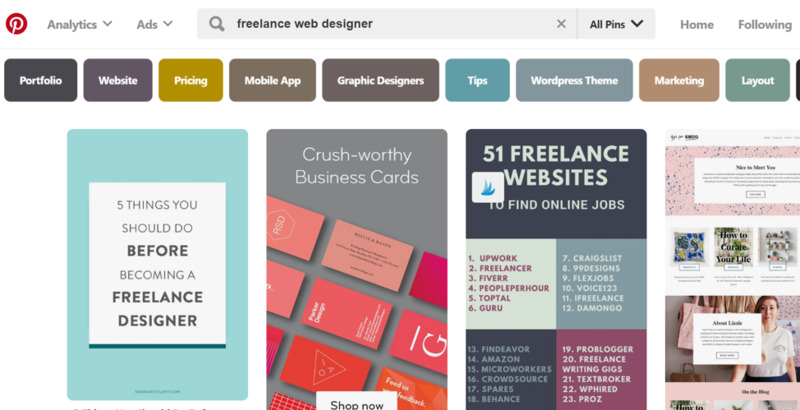 Above, you can see that when you type ‘freelance web designer’ into the search bar on Pinterest, suggestions such as ‘Portfolio’, ‘Pricing’, ‘Tips’, and ‘Marketing’ come up. These are the most commonly searched terms alongside ‘freelance web designer,’ suggesting that a blog post covering some of these topics would be very popular. Quora is a platform that allows anyone to ask a question, and people from all over the world can answer it. We already explained how to use Quora to market your freelance services in a post before, so be sure to check it out. This platform is a great way of establishing yourself as an expert in your field if you have the time to answer questions, but it can also be used as a way to generate new ideas for your blog. If you search for your blog niche, you’ll find the most popular questions relating to that field. It makes sense to write about the things people are already searching for, so see what questions you could answer in an in-depth blog post. Once you have your ideas for your blog, it’s time to find some keywords to ensure you rank as highly as possible for those search terms. These tools all work in a similar way. You enter your blog post idea (for example, ‘freelance web designer productivity tips’), and you’ll then see the best keywords for this term, as well as the search volume and keyword difficulty - i.e. how easy it will be to rank highly for this term. You may find that ‘freelance web designer productivity tools’ has more searches than ‘freelance web designer productivity tips’ - a simple change, but this can make a huge difference in how your blog post ranks on Google. These tools are all highly effective for ensuring that you have a stockpile of blog post ideas ready to go, and will also ensure that you are writing content that your readers want and need. We recommend making a long list of all the blog post ideas you can think of using the methods above, and that way you can get ahead of your publishing deadlines to ensure you’re never caught short.